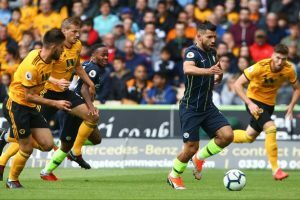 Manchester City dropped their first points of the season following a 1-1 draw at Premier League new-boys Wolves in Saturday’s early kickoff. The hosts took a second half lead after Willy Boly converted a Joao Moutinho cross, though replays showed that the final touch went in off his hand. Their lead lasted little over 10 minutes though, as Ilkay Gundogan’s free kick was headed home by Aymeric Laporte for his first City goal. Sergio Aguero — searching for his first away league goal in 2018 — hit the bar with a free kick in stoppage time, but Wolves clung on to claim a valuable point. Arsenal came from behind to beat West Ham 3-1 and earn Unai Emery his first win as Arsenal boss. West Ham managed to take advantage of some slack Arsenal defending in the first half, with Marko Arnautovic linking up with Felipe Anderson on the edge of the Gunners’ penalty area before firing into the far corner from 20 yards. However, Manuel Pellegrini’s side only had the lead for five minutes, as West Ham failed to deal with a Hector Bellerin cross, allowing Nacho Monreal to calmly finish. A game which could have gone either way tilted back towards Arsenal in the second half, as the hosts went ahead through an Issa Diop own goal. Danny Welbeck made it three in stoppage time and condemned West Ham to a third straight defeat under Pellegrini. Liverpool made it three wins from three and capitalised on Manchester City’s slip-up with a 1-0 victory at home to Brighton. The Reds were not at their best but Mohamed Salah’s first-half strike was enough to secure all three points. Bournemouth and Everton drew 2-2 and both had a man sent off in a thrilling game at the Vitality Stadium. A dull first half was only livened up following a surprise dismissal for Richarlison, who received his marching orders for a headbutt on Adam Smith. Theo Walcott put the 10-man Toffees ahead in the second half before Adam Smith received a red card of his own after bringing down Walcott as he was racing through on goal. Everton doubled their lead soon after, with Michael Keane heading home a Gylfi Sigurdsson free kick. Bournemouth were offered a route back into the match with 15 minutes remaining as Josh King converted from the spot, and they levelled minutes later through Nathan Ake. Claude Puel had a happy return to St Mary’s as his Leicester side beat Southampton 2-1. Ryan Bertrand’s stunner put the home side ahead but Demarai Gray equalised before Pierre-Emile Hojbjerg was shown a second yellow card with 15 minutes to go. That proved costly as Harry Maguire scored the winner for Leicester in stoppage time. Huddersfield and Cardiff played out a drab 0-0 draw at the John Smith’s Stadium as both sides searched in vain for their first win of the season. Huddersfield midfielder Jonathan Hogg was sent off midway through the second half for an off-the-ball altercation with Harry Arter, but Cardiff were unable to make their one-man advantage count.